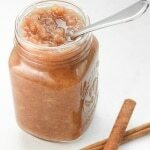 Remember that easy slow cooker applesauce I made a few weeks ago? 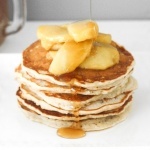 Well, what better to way to use some of that up than by making fluffy applesauce pancakes with caramel apple topping? Um, yes please!!! Say hello to the perfect fall breakfast! I love pancakes but I am always too rushed during the week to be able to whip up a batch. So, I try to treat myself to a batch on the weekends. And since we have officially entered fall, it only makes sense to incorporate fall flavours, aka. use up my applesauce. These pancakes are fluffy and bursting with apple and cinnamon flavours. 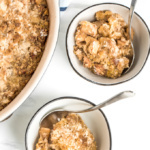 The caramel apple topping takes this breakfast from pretty darn good to absolutely exquisite! I sometimes double this part so that I have extra to just eat with a spoon. It’s that good. But of course, the topping is optional. So if you are crunched with time, you can still have an amazing breakfast and just top these applesauce pancakes with butter, syrup and/or whipped cream. There is no better way to use up leftover applesauce than by making fluffy applesauce pancakes with caramel apple topping! 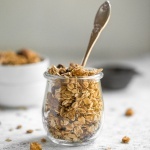 It is the perfect fall breakfast! In a small saucepan, Melt butter over medium-high heat. Add apples and stir until they are coated with butter. Stir in brown sugar and mix until dissolved. Cook sauce for 5 minutes until apples are tender, stirring occasionally. 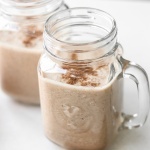 In a medium bowl, whisk together the applesauce, milk, egg, butter and vanilla. Add the wet ingredients to the dry ingredients and whisk until just combined (batter will be slightly lumpy). Do not over mix. Dampen a paper towel with vegetable oil and rub on a large frying pan or griddle, or spray with cooking spray. Heat pan over medium-low heat and add pancake batter using a 1/4 measuring cup. Pour as many as fit in your pan or griddle. Cook for 1-2 minutes until small bubbles have began to form on the surface and edges and the pancake is golden brown. Flip the pancake over and cook for another 1-2 minutes until the other side is also golden brown. Stack the pancakes and top with maple syrup and caramel apple topping. For a thick pancake, add a little less milk. For a thinner pancake, add more milk until you reach your desired consistency. 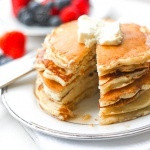 To make these pancakes, use my slow cooker applesauce recipe. I love pancakes! I have to make this on the weekend for my family. What a great fall breakfast. My son loves pancakes. I will try your recipe for him. I think he will love this a lot. I made applesauce the other week too and still have some left in my fridge! I’m going to use it up in these pancakes for my girls for breakfast tomorrow!! Thanks for the recipe! Oh, heavens, that looks amazing! The perfect Autumn breakfast! Caramel apple topping?! Looks divine!! !